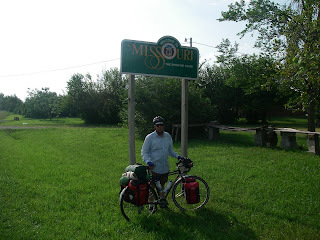 We crossed into Missouri today. It was warm, some of you Salinas natives would call it hot! But, it wasn't as hot or humid as it was yesterday in Pittsburg. The terrain has become rolling to hilly. It's kind of nice for a change, but we hear from other cyclists that it will become downright steep in the Ozarks... something to look forward to. In Kansas we never got out of our middle chain ring or exceeded 30 mph, our first day in Missouri we used the small chain ring and exceeded 35 mph. We're not in Kansas anymore Toto! In route, a man in a beatup old pickup pulled up next to us and shouted that if we needed good water to follow him. He shortly turned into a driveway and lead us to a well on his farm. While we filled our water bottles and slaked our thirst with cool sweet water, he told his life story. We thanked him for his thoughtfulness and rode on. Dave said he reminded him of his grandfather who grew up on farms in Oklahoma. Well tonight we have landed in the lap of luxury! 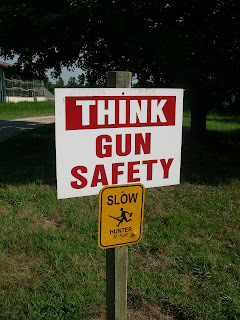 Just outside of Everton is the Running Spring Farm, a bird hunting resort run by Bill Cork. For forty bucks we have a stocked kitchen, dining room, living room w/ satellite radio (listening to the Bluesville channel), and a great bed. so it looks like you guys figured out the internet problem? i hope you have a good time in Missouri. also, a belated congratulations on hitting the halfway mark! Yea, many people pay over forty dollars for rent and have to stock (and clean)their place themselves! Have a great second half! Hey Daniel, well sometimes it works better than others. Thanks for the good wishes. I'll check out your pics right after this. Thanks John, well we were asked to do our own dishes, but we're not complaining!